Terahertz rays -- radiation between microwaves and infrared rays on the electromagnetic spectrum -- are a promising means of detecting explosives, but they've proven hard to generate cost effectively. 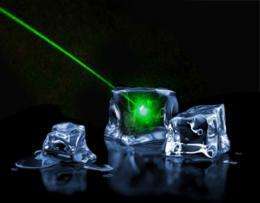 So far, solid-state lasers -- the cheap, miniature type of laser found in CD players -- have been unable to produce terahertz rays unless theyre supercooled, which makes them impractical for mass deployment. Some researchers had even begun to suspect that a room-temperature, solid-state terahertz laser was physically impossible. 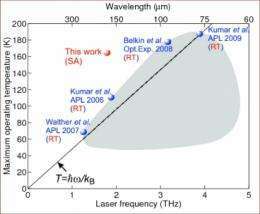 The performance of experimental terahertz lasers built in the lab has suggested a linear correlation between operating temperature and frequency, in which halving the frequency requires roughly halving the temperature. This led some scientists to speculate that frequency and temperature are linked by some fundamental physical law, a strict proportionality that couldnt be violated. That hypothesis, however, turns out to be wrong. In the latest issue of the journal Nature Physics, a group of researchers at MIT and Sandia National Laboratories report a solid-state terahertz laser that operates at nearly twice the temperature that that putative proportionality would have predicted. That temperature is still too low to be practical for airport scanners or devices in a bomb squads tool kit, but it suggests that the quest for room-temperature terahertz lasers shouldnt be called off just yet. At low frequencies, however, the gaps between an electrons energy states become smaller, which makes it harder to coax electrons into exactly the right state for photon emission. Lower temperatures, in turn, allow for more precise control of the electrons energy levels. To address the problem of shrinking gaps between energy states at low frequencies, Hu, together with Sushil Kumar, a postdoc in his lab, Ivan Chan, a graduate student in the lab, and Sandias John Reno built a laser in which the applied voltage causes electrons to jump into an even higher-energy state than usual. Through a phenomenon called scattering, the electrons then release some of that energy as physical vibration rather than as light. They remain in an excited state, however, and release most of their remaining energy as photons.